A surprisingly unsentimental story about a young girl whose life is changed in completely unexpected ways when her family emigrates from 1930s Germany to Canada. Eight-year-old Anna Solden, growing up in mid-1930s Germany, is clumsy, slow, and practically illiterate - inviting her clever and athletic older siblings' constant ridicule; her teacher's scorn; and her mother's perpetual disappointment. As a result, she is sullen and withdrawn - her father is the only person with whom she has a close relationship. And even he becomes a target of Anna's resentment when he seizes an opportunity to relocate the family to Toronto, since despite her fierce unhappiness Anna is even more afraid of moving to a new country with a strange language. There are many elements that set this book apart. For one, the set-up is quite original in that it concerns a "normal" German family emigrating from the Third Reich: the Soldens leave Nazi Germany because they want to, not because they are threatened by being Jewish or political dissidents (though private school teacher Mr. Solden does mention he wouldn't be able to work at a public / state school given his political opinions). From an adult perspective, Mr. Solden's actions seem even more radical: at a time when many Germans could still ignore the negative aspects of the Nazi regime, he sacrifices his position as an English teacher at a prestigious school to become a grocer. Little also depicts the emotional landscape of the Solden family realistically. Though Anna is portrayed sympathetically to the reader (note that Little herself is legally blind), she's no blameless victim: the narrative makes it amply clear how frustrating it can be for Anna's siblings to navigate her prickly and private moods. 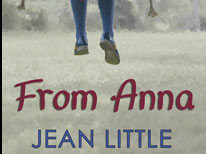 I've read this book so many times that I don't know if a young first-time reader would realize that Anna's visual impairments are the cause of her clumsiness and slowness before her diagnosis - in retrospect, her inability to see dust or the letters on the classroom blackboard makes the root of her issues quite apparent. But I also wonder if any slow or clumsy readers feel cheated when Anna receives a "quick fix" in form of her glasses - though this is subverted since even with glasses Anna's vision remains highly limited, and her new environment (especially her kind teacher) are key catalysts in making her a happier person over a longer period of time. And from a literary theory perspective, I can't help but read Anna's gift of (relatively) clear vision and happiness as a metaphor for Canada being a land of freedom and acceptance, in stark constract to harsh regimented life in Nazi Germany ("in the Third Reich, things are impossibly hard - in Canada, things aren't perfect but definitely better").